1) Preheat oven and make dough: Preheat oven to 300 degrees F. In food processor, add coconut, sesame seeds, dates, ginger, and salt and blend until seeds are all pureed in. It will take 5-7 minutes. Note: At first it may not seem like it will come together, but with enough blending, it will form a nice, sticky dough. 2) Make teaspoon-size rounds, bake, and press: Use a 1-teaspoon measuring spoon to make tiny rounds. Place on a parchment paper-lined baking sheet. Bake for 15 minutes, until golden on the bottom. Immediately after removing cookies from oven, gently press them flat with the bottom of a small drinking glass so they look like cookies instead of mounds. 3) Store: Allow cookies to cool and store them in an airtight container for up to five days or freeze for up to three months. Lemon cookies: Swap the 2 teaspoons of ginger for 1 teaspoon of finely grated lemon peel and 3 tablespoons lemon juice (1 lemon). 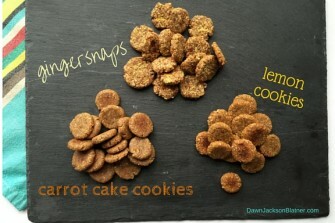 Carrot cake cookies: Swap the 2 teaspoons of ginger for 1/4 cup finely grated carrot (1 carrot) and 1/4 teaspoon nutmeg. I also top each with a little grated carrot before baking —so pretty. Just made these! Easy. Nice chewy texture. Healthy and delish! Will try lemon and carrot cake next. I want to try these but my daughter is allergic to all nuts. I’m scared to try it using the raw sesame seeds. Is there something I can substitute in its place? It is true that kids/people allergic to tree nuts MAY also be sensitive to sesame. For the 1/2 cup sesame seeds, you can use raw sunflower seeds. You can even throw in some hemp seeds, too. I am allergic to coconut. Is there something I can swap out? I would love to try these for my occasional sweet tooth. I used raw walnuts instead, was super good! Hi Dawn! 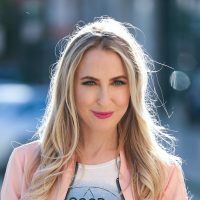 If following your Superfood Swawp plan, how would things like your cookies, green smoothie pops, popcorn , and dark chocolate square fit into the plan? I have your plan all printed out and am loving it so far. Thank you!! SNACKS are always PRODUCE + PROTEIN, function-not fun. SWEET/TREAT/ALCOHOL are always SOCIAL & FUN, never at home-never alone. However, rules were made to be responsibly broken once in awhile…so that’s where things like the dark chocolate, popcorn, and cookies fit in…they are TREATS that are fine to swap once in awhile for the usual perfect produce + protein SNACKS. TREATS won’t be as FILLING as the produce + protein SNACKS so you can’t do it ALL the time, but definitely on occasion… it’s a must.